Now that we have a good start on the tree trunk, it's time to take into considerations the details that have made this Old Oak so interesting to me. 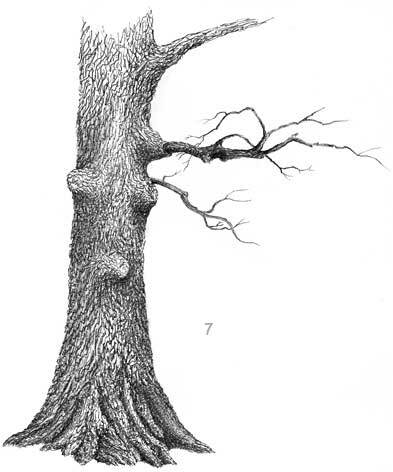 The trunk has three large bumps of growth on it just below the first small branches. These are large raised, bark covered objects of growth. They are not that difficult to put in and keep the tree interesting. Notice that they have a highlighted side and a shadowed side. Also, that the bark is much tighter as it works around the growth. The goal is to work your bark growth lines up to the point just below the bottom of the first growth bump. Then begin to work the lines in a very light tone from the trees left side into the center of the bump. Next work the right side of the growth bump. Here is where you want to build the darker shadows that will force the highlighted portion of the bump to appear to come forward away from the rest of the trunk and bark work. I switch to the medium point pen now and go back and add the next layer of tone to the shadowed area of the bumps. From this point I work toward the first limb and branches with growth lines in the bark that lead you to them. I choose the limbs I want to render and determine which would be drawn first and if there will be any over-lapping limbs or branches. Work out to where the over-lap will be and then stop. Work the next limb or branch to and through the place of the overlap. I keep in mind my light source as I put in my shading and depth lines in each branch and limb. 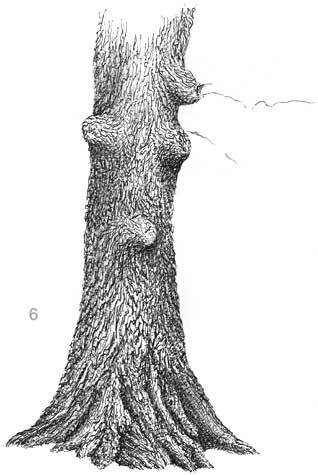 The next portion of the drawing work in the oak tree is to finish the limb and branch work. Using the methods that we used in the bark work, continue the line layers in the growth direction. I use light pencil lines to put in the basic direction that I want the limbs and branches to go in keeping with the reference photo. There will be less detail line work in the smaller limbs and even less to none in the smaller branches and twigs that get farther away from the viewer in the scene. This is also true just due to the size of the branches and twigs. 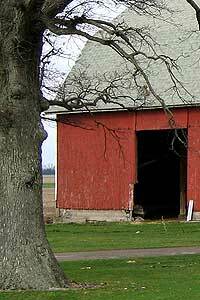 Keep in mind where limbs and larger branches will over-lap and run in front or behind each other. This is also a point that you can add in cast shadows to lower branches from those above or beside. 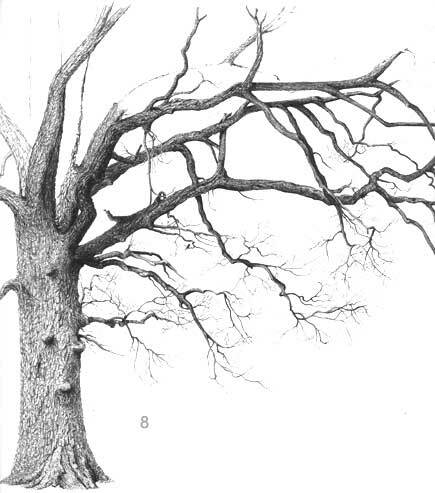 These little details help build the depth and dimension in the tree drawing itself. This is where the darker tones in the branches come in as you work up the tree. Remember that there are very few to no perfectly straight lines that occur in the growth of a tree in nature especially in this type of Oak tree so, as you work through the limbs and branches keep your lines flowing off the straight and flat path. Gravity and the wind have a lot to do with how a tree grows and looks in nature. Think about the weight that would be in the limbs. Show the stress of that weight in each branch as gravity tugs and pulls each one toward the ground as it struggles to grow Up and Out reaching for the sun light it needs. It’s a living thing that struggles against the elements to survive. 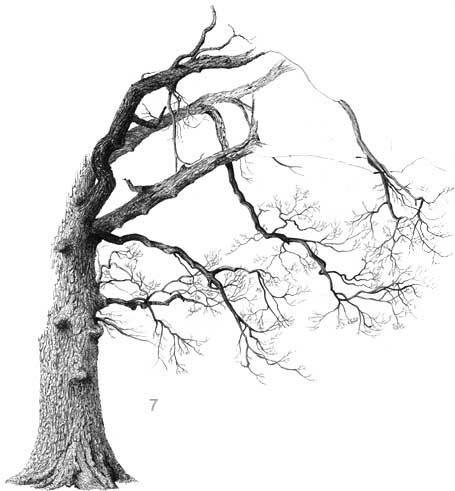 Let that struggle show in your rendering of the tree in each branch and limb. Then as you get to the ends of the limbs and branches notice that the twigs arch slightly upwards. This is that struggle of the tree to constantly keep itself pushing upwards to the suns rays. 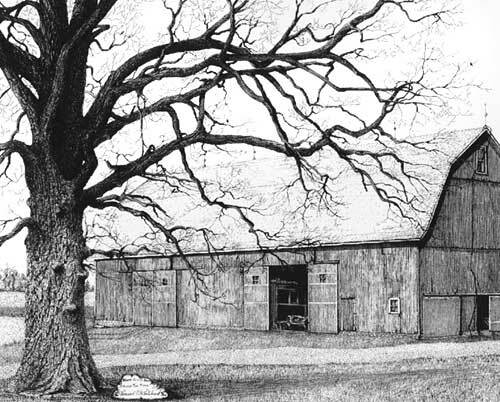 I love to draw these grand old trees when the foliage is gone. It allows me to show each of the turns and bends that time and the elements have brought the tree through. Each tree has a character all its own. I strive to show that character in each drawing I do. If you notice this last Work In Progress image, you will see that I have already added the oak’s first resident... a bird resting on a branch. There will be many more of these to come before I call the drawing finished. To finish the tree I work the rest of the limbs and branches to the edge of the page and out into the scene. The diameter of the limbs and branches get smaller as I said before, the farther away from the viewer they get and the more toward the end of the branch that they grow. I hope that this tutorial has been and will be helpful to you to see how to render the different types of trees out there. This is in no way meant to be an exhaustive study on all trees. It is meant to help guide you as you study to develop your own skills as an artist. If you have any specific questions for me please and I will be happy to answer them.